Terntank has released a statement claiming that it has taken delivery of the second of four LNG-powered newbuildings from AVIC Dingheng Shipbuilding in China. The M/T Ternfjord oil/chemical tanker has left the shipyard to load a cargo from the far east to be delivered to Europe. Once the vessel arrives in Europe, the company claims that it will enter a time charter to Esso Norway. 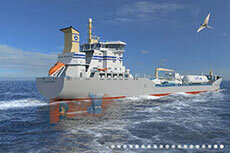 The 15 000 dwt vessel is 147 m long and features a Wärtsilä 5RT-flex 50 DF 5.850 kW 102 RPM 2-stroke, low pressure, LNG dual-fuel engine. The LNG fuel storage tanks have a capacity of 630 m3. The Port of Rotterdam has announced that the Ternsund product tanker, which is currently on its maiden voyage, will become the first sea-going vessel to bunker LNG at the port. 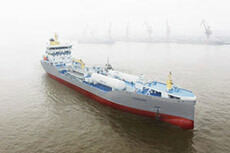 Terntank, the Denmark-based tanker operator, has decided to order a further two LNG-fuelled 15,000 DWT tankers. 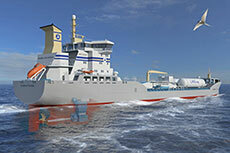 Terntank sign contract with Chinese company AVIC Dingheng Shipbuilding to build two LNG vessels.